Finding a really good chocolate cake is a precious thing. And not always so easy, which is why I was THRILLED that this made up (by yours truly!) chocolate orange cake recipe turned out just as yummy as I’d hoped. I don’t wish to sound like a prima donna (as poor Mr. Scrummy was recently accused of being after he wrote an email to a B&B to check they served real coffee! ), but I’m often disappointed by layer cakes I order in cafes. They always look delicious, but rarely are. They might be dry, or lacking in taste, or too sweet, or all of these things – just not half as good as I hope them to be. So making a simple layer cake that’s good (really good) has been on my ‘blog bucket list’ for quite a while. To be honest layer cakes are not really ‘my thing’ so I knew this would be a bit of a challenge. My only other attempt was this white chocolate, coconut and lime truffle cake – absolutely delicious, although I say it myself, but not exactly a winner in the looks department! You may have already noticed that most of the sweet things around here are chocolate things, so no surprises that I chose to make a simple chocolate layer cake first. What might be surprising to you, though, is that I made up my own recipe. I really did. Of course I did plenty of research to try to get the proportions right, but this recipe is truly mine. I was pretty astounded when it turned out really well on my first attempt! 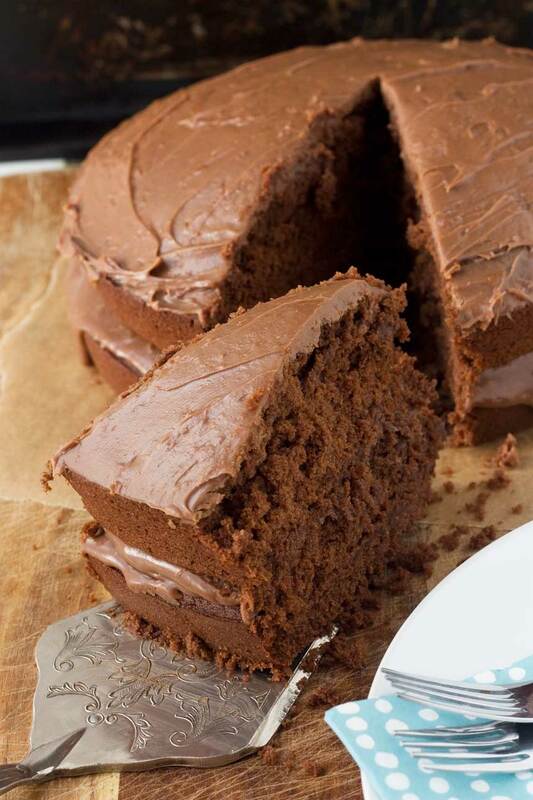 Cakey, moist and fudgy… mmm! What I was aiming for was a proper light spongy cake, not a brownie cake, or soufflé, or chocolate torte, or anything else. But at the same time I wanted it to be nice and moist, a bit fudgy even. And honestly, that’s exactly what I ended up with. I just couldn’t believe it. I’m not sure what the secret was. The milk I added, perhaps, or the bit of melted chocolate as well as cocoa? The salted butter, the spoonful of instant coffee to intensify the chocolate-y taste, or reducing the amount of sugar a bit to give it a richer, darker taste? Or maybe the rich, creamy chocolate orange ganache that sinks into the two layers of the cake a bit and makes it just a little bit gooey in the middle? I really don’t know, but somehow I hit the nail on the head. A light, rich and moist chocolate cake sandwiched together with a creamy orange ganache. In short, a really good chocolate cake! Preheat the oven to 180C/355F (170C/340F fan oven) and line the bottom of two 8-inch loose-bottomed cake tins with a circle of baking paper. Grease the pans lightly with butter, then set aside. In a large bowl, blend the cocoa and coffee with enough hot water to make a smooth paste. Add the butter and sugar to the bowl and cream together well with a hand-held electric mixer. Add the eggs, milk and melted chocolate and mix again until smooth. Fold in the flour and baking powder, then divide the mixture between the two cake pans. Bake for about twenty-five minutes or until the cakes are risen and pulling away from the sides of the pans. Remove from the pans and cool completely on a wire rack. Meanwhile, to make the ganache, melt the chocolate, then stir in the warmed cream, and then the orange zest*. 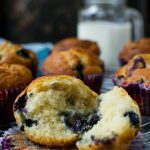 Let cool in the fridge until a nice spreading consistency. Use half of the ganache to sandwich the two cakes together, then spread the rest over the top. *I usually melt chocolate in the microwave in 30-second bursts. If you don’t have a microwave, just melt it in a bowl over a pan of boiling water (but don’t let the bowl touch the water). You can warm the cream separately. Or just add it to the melted chocolate cold like I did, then pop the bowl in the microwave for 20 seconds or so. When it comes out, stir well to blend. 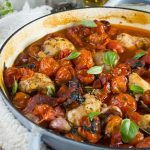 Please note that when I first created this recipe I was working in metric (UK) measurements, which is why some of the US measurements might look a bit random! The recipe still works fine, of course! This cake looks gorgeous Helen! Love the spongy texture! Chocolate and orange is one of my favorite combinations.Will definitely try the recipe, love how it turned out! Thank you, Mira … I really hope you do try this! Hello! I’m making this cake and I wanted to know what type of chocolate I should use? Did you use Baker’s Chocolate or ? Thanks for any help! I can’t wait to try this cake! Hi Anna! Any good quality chocolate of your choice is fine. I haven’t tried it with Baker’s chocolate, but that would probably be fine too. Good luck! I am absolutely in love with this cake Helen! Chocolate and orange is the best flavor combination ever and I love how it’s light and spongy and yet slightly fudgy! Just the perfect texture! And I so agree with you on the cafe layer cakes! they somehow just don’t cut it for me too! Thanks, Samina chocolate orange is my fave, but I’d never tried it in a cake until now. It was every bit as good as I hoped! That is one delicious looking cake! I am also usually disappointed with cakes in cafes, which is why if I am craving some cake, I will make some myself, then I can only be disappointed with myself haha. 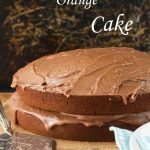 Helen, this is a gorgeous cake – it looks so light, I love the coffee in it and I love the hint of orange in the ganache! I’m kind of a cake snob. I mean, if I order a slice of cake and it’s not good, it’s not worth the calories, right? I totally hear you, and I love the looks of this cake! 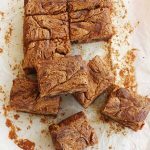 The chocolate-orange combination is delicious, and this looks so moist. The fact that it’s simple makes it irresistible! Ha … cake snob. I love it! And if you’re one, then I’m definitely one too. I agree that only good cakes are worth the calories, and glad you think this fits into that category! My favorite cake is chocolate and I love the addition of orange. Cake perfection. Thanks Janette … glad you approve! You are not a prima donna I totally agree. The cake will look fantastic and when you taste it it’s stale and dry. Super disappointing. Your cake sounds anything but! I could go for a big slice of this right now! Sold! Nail on the head, indeed! 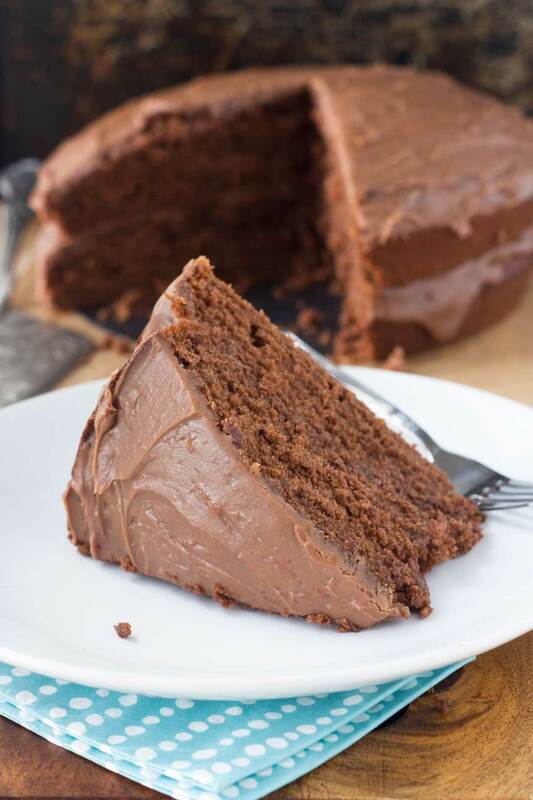 This cake looks so wonderfully moist, rich, and just perfect! There are so many aspects I love about this dish – the chocolate, coffee, orange, salted butter, it all just sounds so wonderful, Helen! Thank you so much, Jess! I thought you might like this. You are one of my cake gurus, so it means a lot to get compliments from you on my cake! Hi Helen, your chocolate orange cake is quite the showstopper, love the way it looks, now I want this for breakfast. Oooh, thank you Cheri! If I lived close to you I would pop over with a piece of this for your brekky! Have a lovely day! 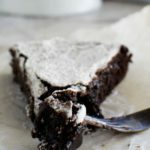 Your 6 ingredient chocolate cake is one of my go to quick bakes, no fail every time. So it goes without saying that this makes my list too 🙂 Sharing! Thanks, Lorraine! Needless to say, we didn’t stay there!! Totalement d’accord avec toi Helen! 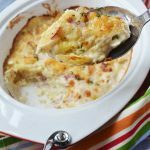 La plus part de fois ces types des gâteaux ne sont pas bon, la plus part de fois sont trop sucrés! J’en suis persuadée que le tienne est très bien et j’adore l’idée de mettre des zestes d’orange, l’association est parfaite! Ce gâteau mérite bien un tasse de café, du vrai! Thank you for saying we’re not prima donnas, Dini!!! And glad you like the cake – oooh, now I want to make another one! Chocolate and orange is my favorite flavor combo! I can’t wait to try this out. Me too! Hope you give it a try, Kathy! 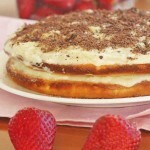 Love this cake recipe!! Done it twice already and it was amazing but third time I added little water to the cocoa coffee mix and they cake turned out dry 🙁 Is there any tried amount for adding water? Like 1 cup or so. Hi Nadine! 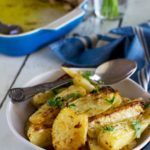 So happy you like this recipe as much as we do! It’s a coincidence though that you mention being a bit disappointed the last time you made it, because exactly the same happened to me. I’ve been making it for ages with great results, and then just recently I made it and it turned out slightly more on the dry side – just at the edges, really. In my case, I don’t think it had anything to do with the liquid (I just mix the cocoa and coffee until it’s a pouring consistency) – I think I slightly over-baked. So maybe check the cake after 20 minutes and then every couple of minutes after that? 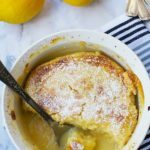 Hi Helen – I’m a first-timer on your blog & I must admit all your recipes look amazing! I was wondering whether you’ve tried adding orange zest to the cake as opposed to the ganache? Or do you think this would be flavour-overload? 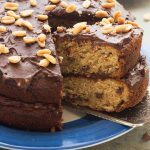 This tasted great and was easy to make but i find it didn’t rise much at all – each cake turned out to be about 1 inch thick and the picture makes it look a lot thicker – maybe my pan was too big??? But it is great – thank you! Hi! Can I ask, what %cacao chocolate did you use for both the cake and the ganache? Or did you use milk chocolate? Definitely going to try this for my Mum’s birthday cake tomorrow! Hello Ellie! I’m so pleased that you’re going to give this a go! If I had a choice, I’d use some nice dark chocolate to put inside the cake batter (any %) and milk chocolate for the ganache, but to be honest any chocolate will work. Totally up to you! Good luck! can you tell me what the ingredients are in U.S. measurements? I made it, and as the caption suggests, it was really good, really simple. Loved the fudge like texture. Not over-sweet, just perfect. I, however, added the zest to cake batter in stead of the icing. And that way I got freshness of orange in every bite. Thank you Helen for sharing the recipe. Looking forward to more. How orangey is this cake? I’m hoping to make it for my birthday but I want the chocolate to have an unmistakably orange flavor. Hi Kiara! Sorry it’s taken a while to reply – we’ve been moving this week so I’ve been a bit slower at responding to comments than usual. I hope I haven’t missed your birthday! If you’d like an extra orangey cake, add the zest of another orange to the cake mixture as well as to the ganache. I’ve tried that and it definitely made it taste even more orangey. Good luck! Great cake, loads of comments on how nice it is from friends and family. Made for my husbands birthday and the whole family couldn’t get enough of it! Hi Becca. Thank you so much for taking the time to give your lovely positive feedback. You’ve made my day! This is one of my favourite cakes too, and now you’ve made me crave it again! Oh yes! This cake sounds delicious. 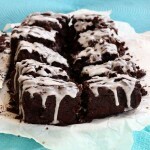 Coffee with cocoa makes a delicious difference in bringing out the chocolate flavor in baked goods. I’ve also been know to inquire about the details where I’m staying. Good coffee is a must!! This cake looks gorgeous!! 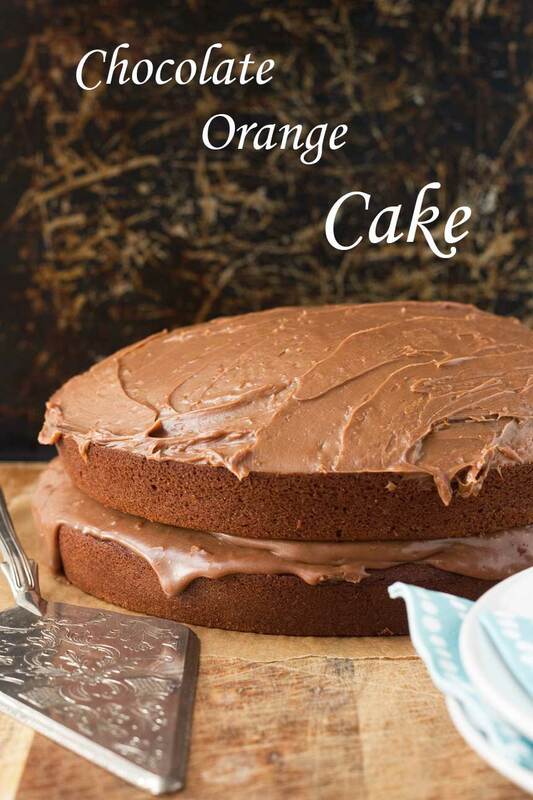 I’m a big fan of the chocolate orange combo, so I’m sure I’d LOVE this! Hi Sue! Thanks for your great feedback. I really hope you try this some time!